Apple has published an overview of its carbon footprint for 2011, breaking down how factors such as manufacturing, transportation, product use, recycling, and its facilities influence its effect on the environment. The company estimates that it was responsible for 23.1 million metric tons of greenhouse gas emissions in the year 2011. According to Apple, 98 percent of those emissions are related to its products’ life cycle, with just 2 percent chalked up to the company’s facilities. That’s up significantly over the company’s emissions in 2010, which measured just 14.8 million metric tons. To a certain extent, that’s to be expected, as the record quarterly sales the company keeps racking up suggest that Apple is producing and shipping more products than ever. But Apple says the amount of its greenhouse gas emissions per dollar of revenue have actually decreased since 2008, to the tune of 15.4 percent. Since it can be hard to gauge what numbers of that scale mean, I attempted to pull up the environmental reports from three of Apple’s competitors: Samsung, Dell, and HP. It’s difficult to make an apples-to-apples comparison among the three, however. Not only do their roles differ—for example, Samsung is a large consumer electronics business that not only produces PCs and smartphones, but also TVs, digital cameras, and home appliances—but the companies don’t always report the exact same figures. Of the three, to date only Dell has reported its fiscal year 2011 greenhouse gas emissions, which it totaled at 481,007 metric tons. The company also calculated its emissions at 7.14 metric tons per $1 million of revenue; Apple provides a similar figure of roughly .21 kg per dollar of revenue, which would come out to about 210 metric tons per $1 million of revenue. The GHG Protocol divides greenhouse gas emissions into three “scopes.” Scope 1 includes all direct greenhouse gas emissions from sources owned or controlled by the company; scope 2 includes indirect emissions, those from the consumption of purchased electricity, heat or steam; and scope 3 includes indirect emissions such as the extraction and production of purchased materials and fuels, transportation not controlled by the company, and other third-party expenditures. Not all of the companies report all of this information. Dell, for example, only reports business air travel for scope 3 emissions. HP does break down its emissions into a number of categories; it reported that it produced 1,865,200 tons in 2010 just from its own operations, with additional emissions coming from business travel, product manufacture, transport, use, and recycling—all totalled, that would equal about 26,953,200 tonnes of greenhouse gases emissions, more on par with Apple’s reported figures. The company’s 2011 figures were not available at the time of writing, though a company spokesperson told Macworld that they should be published in late April. According to its 2010 report, Samsung only accounts for scope 3 product use on eight globally sold products and for most, but not all of its partners (the most recent data on those partners was from 2009). Several of its figures are broken down between Korea and overseas emissions as well, but the company says it produced 10,655,000 tons of greenhouse gases in scopes 1 and 2, with an additional 45,706,000 tons produced in scope 3—that’s a total of more than 55 million tons. Samsung says that globally it produced 6.41 tons of greenhouse gases per 100 million Korean won in sales, which—as of currency conversions at the time of writing—works out to a rather hefty 72.1 tons per $1 million. Apple doesn’t say if it uses the GHG Protocol to measure its emissions, but its report does cover manufacturing and suppliers, which seems to suggest it provides a comprehensive overall picture. The company also says that its calculations adhere to the International Standards Organization’s ISO 14040 and ISO 14044 specifications for reporting the information. To the same end, Apple touts the fact that many of its products, for which it produces detailed individual impact reports, have vastly reduced carbon emissions over their predecessors. On the top of that list is the Apple TV, whose current incarnation is responsible for 90 percent less carbon emissions than the version that appeared in 2007. Likewise, the 2011 iMac’s carbon emissions have been reduced 50 percent over the original model released way back in 1998, and the 2011 Mac mini has dropped 52 percent since the 2007 iteration. 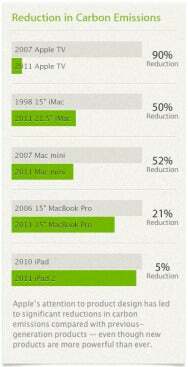 Even the iPad 2 has been reduced 5 percent over its predecessor. While some of that has to do with the manufacture of the products—Apple estimates 61 percent of its overall greenhouse gas emissions are related to that portion of the product life cycle—much of it has to do with ancillary factors, such as transporting those devices to stores and customers. Because the company has reduced the size of packaging in many of its devices, it can fit more boxes in the same capacity, thus reducing the number of planes and flights needed. For example, Apple says that it’s reduced iPhone packaging 42 percent between 2007 and 2011, meaning that one fewer 747 flight is needed for every 371,250 units shipped. Apple even tracks the energy consumption of its employees’ commutes. In 2011, the company says it saw a 61 percent increase year over year in the number of employees using the company’s Commute Alternatives program. That includes Apple’s biodiesel commuter coaches, which served more than 1100 employees per day, an increase over 900 employees per day in 2010. Other achievements for the year 2011 include the company’s elimination of restore DVDs for Macs and the conversion of iTunes gift cards to 100 percent recyclable paper. And there was the introduction of the Mac App Store, which helps reduce the company’s carbon footprint by providing digital downloads of software without the need for packaging, transportation, and recycling. But, of course, that comes with a tradeoff—making software available online means that Apple needs to invest more in the infrastructure of its server side capabilities, specifically by building out data centers. Those data centers are a not insignificant part of Apple’s environmental footprint, in particular the company’s much talked about massive new facility in Maiden, North Carolina. While much of the information in Apple’s yearly report is an update of figures that it’s reported in the past, the information on the Maiden data center, constructed last year, provides some tantalizing new details. For one thing, Apple says the data center earned the Leadership in Energy and Environmental Design (LEED) Platinum certification from the U.S. Green Building Council. That score signifies that the building has earned at least 80 points on the 100-point LEED scale, which measures a building’s environmental impact over categories such as sustainable sites, water efficiency, energy and atmosphere, materials and resources, and indoor environmental quality. In addition, the company plans to focus heavily on renewable energy with the new data center, stating that it will build the nation’s largest end user-owned solar array and the largest non-utility fuel cell installation in the U.S.
Apple goes into further detail about the Maiden data center in its page on environmental progress, explaining its use of a chilled water storage system to improve cooling efficiency, outside air cooling, a cool-roof design that provides solar reflectivity, high-efficiency LED lighting hooked up to motion sensors, and a construction process that used 14 percent recycled materials and diverted 93 percent of construction waste from landfills. While the Maiden data center was the subject of intense scrutiny during its construction, it was officially unveiled to the public during Apple’s 2011 Worldwide Developers Conference keynote, to illustrate then CEO Steve Jobs’s point that Apple was serious about its commitment to iCloud. A more public commitment to the environment has been an Apple priority since 2007, when Jobs penned the open letter “A Greener Apple.” In it, he fought back against criticisms by environmental organizations such as Greenpeace, which had taken the company to task for not doing enough to reduce the use of toxic substances in its products. Jobs said the company would soon be ahead of its competitors in that realm, and promised improving its recycling goal—a milestone it ended up beating a year ahead of schedule. 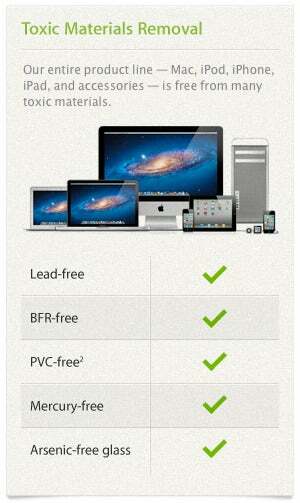 Since then, of course, Apple has eliminated those materials across its line-up, producing devices that are free of PVC, arsenic, mercury, lead, and brominated flame retardants (BFRs). The company also points out in its latest report that, among its competitors, it is the only one whose entire product line meets and exceeds the Environmental Protection Agency’s Energy Star specification for power efficiency. As of Greenpeace’s November 2011 Guide to Greener Electronics, which ranks various technology companies, Apple held fourth place, after HP, Dell, and Nokia. The environmental organization gave the company plaudits for its products, but dinged it on some of its policies and a lack of emissions goals.